I remember the day I accepted the Lord as my Savior. The day darkness was stripped of its power over me. The day that hope restrained hopelessness, destiny devoured despair and death gave up the ghost to eternal life. It was a day Ill never forget; it was the beginning of a beautiful relationship. I loved the Lord with all my heart, soul and mind and yet somewhere along the way I got distracted an… d before I knew I was disconnected. It began so subtly that I was caught unaware and before I knew I was lost and alone. I had to find my way back to Jesus! 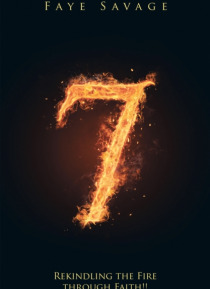 7 begins with me bound in doubt, discouragement, and despair struggling to regain my relationship with the Lord. The road ahead of me is filled with twists and turns that will require dedication, commitment and perseverance. My adversary is cunning and skillful in his attacks. When he strikes the blows are devastating. He has one goal and that is to destroy my relationship with the Lord. His success or defeat will depend upon one thing Let the journey begin!